The Ruggery has been in business since 1921. Our archives are extensive and include many mid-century designs that in the day were considered modern design. The following article takes you from the original sketch drawn by master craftsman George Wells, to the re-designed rug updated for today’s world. Our client was introduced to our archive of designs from the mid 1950’s. 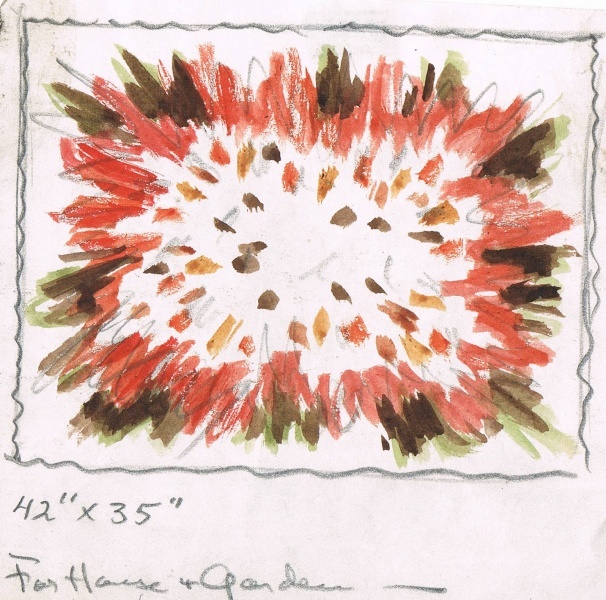 Drawn to a sketch that Mr. wells produced for House and Garden Magazine. Original sketch and rug made at The Ruggery in 1954. 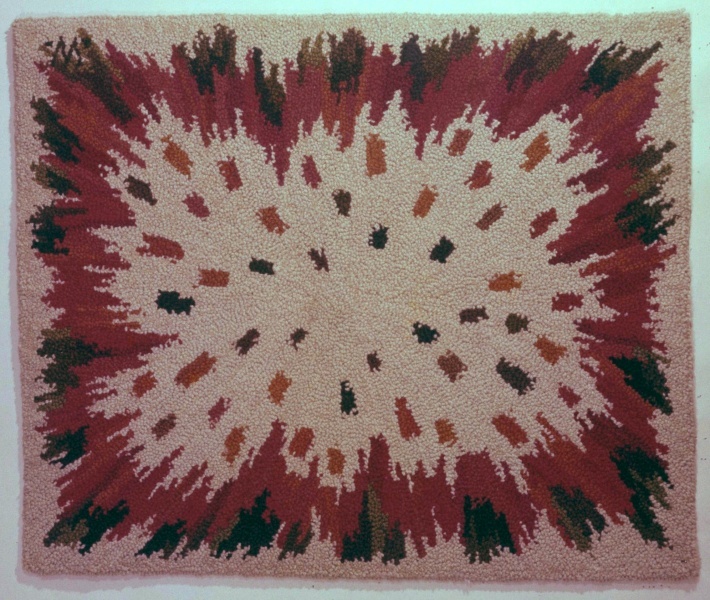 Today,s rugs are hand dyed and hand hooked in the same tradition that has been used for 100 years. The next step was to update the color pallet, and resize the rug for the sitting room,where the rug would eventual be installed. The original was a 42″x35″ the new size would be a 8’x 10′. 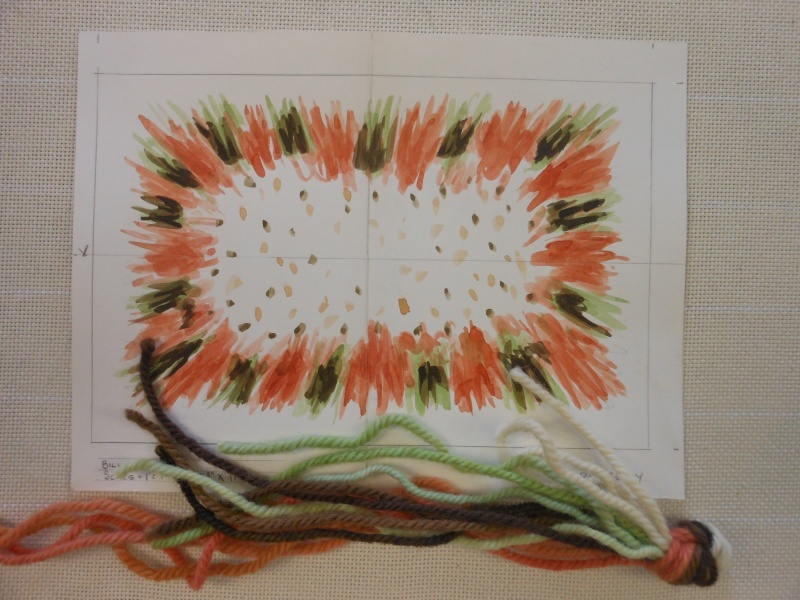 A new water color sketch is drawn to scale 1″=1′ then wool samples are dyed according to the new design. The wool samples are viewed in the room where the rug will be installed. 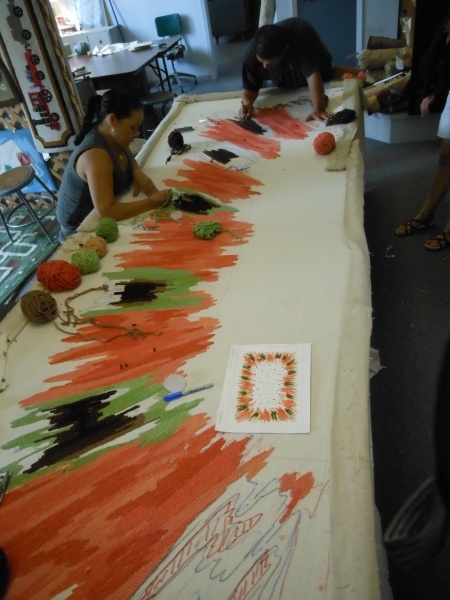 Everything is approved by the client before we move forward with the actual hooking of the rug. The image of the rug is projected onto 100% cotton backing (monks cloth). Charcoal is used for the projection then markers are used for the final drawing on the backing. All the wool is dyed at that point and the hand hooking begins, following the exact pattern and the color sketch is used for reference. When the rug has been completely hooked we apply latex to the back, for strength and durability. The finished side of the rug is sheared leaving the top a beautiful looped effect. Exactly the way the original rug was made. Rugs made this way last a life time and will be pasted down thru generations of family members, they are a true family heirloom. Image courtesy of Bilhuber Inc. 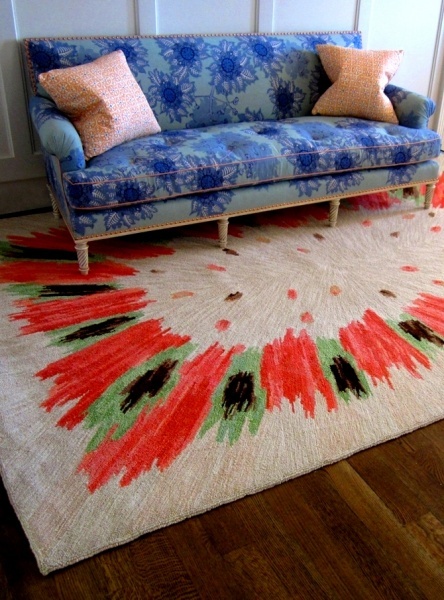 The Rug is installed in it’s new home in California, and makes a great addition to a beautiful home. The designs that we have, were thought of, and designed in the middle part of this century. It’s easy to be drawn into that era when looking through our archives. This is one of many that are waiting to be “modernized” again.